Jim Horner is in his third season as an assistant coach at Shawnee. The teams were back in the locker room due to lightning, which eventually caused a postponement in Friday's football game between Cherokee and host Shawnee, and Jim Horner was taking in the scene just outside. Horner has seen it all, so a postponed game was nothing new. The game was rescheduled for 1 p.m. Saturday at Shawnee. The fans who have to return can only hope the game resembles last year's when Cherokee won a 42-41 overtime thriller. Horner can surely wait one more day to begin yet another season of coaching. He is an assistant at Shawnee. 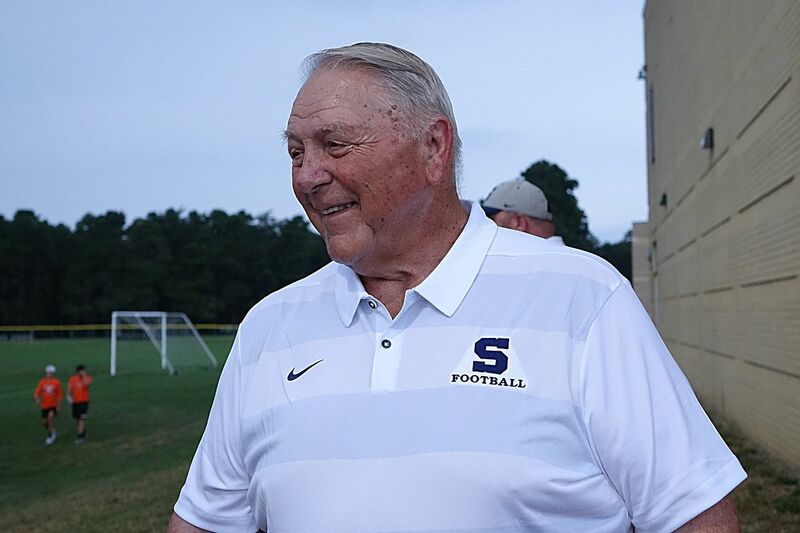 He is also among the most decorated coaches in South Jersey, and few know more about this Shawnee-Cherokee rivalry than Horner. The 79-year-old Horner was the first head coach in Cherokee history, and after the Chiefs went 1-8 that first year, 1976, they have been winning just about every season since. Horner guided the Chiefs to the playoffs their second year in existence, and that is when only four teams per group qualified for the postseason. There were many great teams under Horner at Cherokee, but it would be difficult to top the 1985 squad, one close to his heart for many reasons. One reason is because the 11-0 Chiefs, who were the No. 1 team in South Jersey after winning the South Jersey Group 4 title, were quarterbacked by his son, Kyle. And playing on that team was Brian Glatz, a starting offensive guard. That brings us to Friday because Glatz was ready to make his debut as the head coach of Cherokee before the postponement. He is only the fourth coach at that tradition-rich school and certainly waited his turn after serving as a Chiefs assistant for the previous 23 years. Horner was replaced at Cherokee by John Scott, his long-time assistant coach. After Scott, it was P.J. Mehigan, a former standout at Cherokee, and now Glatz. "I was so pleased and so happy to see it still in the family," Horner said about Glatz's appointment. "From John to PJ to Brian." Of course, it all started with Horner, who had made Haddon Heights a South Jersey power house before going to Cherokee. Horner may not bleed Cherokee orange, but he still has an affinity for the program. And at 79, he remains passionate about coaching. He is assisting a fellow Hall of Famer at Shawnee, Tim Gushue. Horner, who graduated from Paulsboro in 1957, played at Rutgers and began coaching after that, hopes to remain coaching at least two more seasons after this one because he would reach yet another milestone. "That would mean I will have been coaching in eight decades," Horner said. "I Iearned so much from him," said Glatz before boarding the Cherokee bus to go home. "He instilled in us a sense of detail."